In 2014 Alberto Conte, founder of Movimento Lento and Itineraria, rode his bicycle from Milan to Santa Maria di Leuca: more than 2000 km to map places and people who were doing their best to change the territory – and consequently, the country - they lived in. In a hot August day, on a road in the middle of nowhere, he had an idea: creating a tour operator that would offer walking and walking trips on long distance trails and the most beautiful itineraries in Italy and beyond. Alberto didn’t lack experience in the topic: among the first ones to scout the Via Francigena,Alberto worked as a technical adviser for the Ministry of Culture and Tourism for the promotion of the walking Via Francigena itinerary. He wrote several guidebooks for the Italian Touring Club and collaborated with specialized magazines. With his company ItinerAria, founded in 2016, he works with organizations for the promotion of tourism and municipalities to design and create walking and cycling routes, perfectly integrating the real needs of travelers with the most state-of-the-art technology. His Association Movimento Lento, founded in 2011, established itself through the years as a reference point for anyone who loves walking or cycling– or simply want to bring a little slowness into his life. But of course, a Tour Operator is something completely different. Starting from October 2014, a team of passionate newbies worked together to realize that dream; in January a first SloWays catalogue, offering a handful of Via Francigena tours, was finally published online. We have grown so much since then: we became Official Partner of the European Vie Francigene Association, contributed to the planning and creation of the Via Francigena Cycling Route through a crowdfunding project, became more International by joining S-Cape – a European operator offering cycling and walking trips in Italy and Europe, with offices in several European countries. We never stop learning, test ourselves, face challenges with undiminished enthusiasm. Why did we choose to offer Walking & cycling trips? Because we know how it feels to walk in nature or riding a bicycle with the wind on your face, and it’s something hard to forget. When you walk across a territory, you become part of that place yourself: you feel it with all your senses, smell the fragrance of the woods and enjoy the wind caressing your face. When the only sound around you is the rustling of the leaves under the wheel of your bicycle, that roads becomes forever yours – the kind of conquest nobody will ever take away from you. We want to take you to special places and experience them in the most immersive, intensive way – the leading man of a movie you will project forever in your mind. We offer our passion and our experience as travelers to lead you on country lanes, forest paths and ancient pilgrimage ways. We want to share with you our idea of travelling – something that opens your mind, boost your senses and set all your muscles in motion. We love travelling in all freedom and we specialize in self-guided trips. We take care of everything: booking the hotels, transferring your luggage to the next accommodation, supporting you with a 24h service. All you have to do is enjoying your holiday – on your own or with your family or friends, starting whenever you want and choosing the pace of your days. Thanks to our detailed documentation and our special APP – providing maps that you can download and navigate off-line, and information about the hotels we booked for you – you will get easily and safely to your destination and enjoy every kilometer. If you’d rather travel in company, you can join one of our groups: you will travel with people that share your passion for beauty and nature. Our reliable and passionate guides will guide you through the territory and its history, art and legends. Every night, a special place to spend the night in: small hotels, secluded mountain huts, family-owned inns and farms, with great local cuisine and environmentally conscious practices. One last thing: we are the specialists of Via Francigena. We have been continuously working on its creation and promotion and know every inch of the itinerary. Walking or cycling, self-guided or in group, we can plan together your next unforgettable trip on the Camino to Rome. The planet’s resources are not unlimited, our planet is increasingly crowded, and tourism is highly impacting our economic system. · First, we decided to offer walking and cycling trips: low-impact ways of travelling, which leave a light environmental footprint and contribute to your physical well-being. · Our trips – on Via Francigena especially - are always designed so that you can easily reach the starting point of the tour by public transport. In addition to being the most environmentally friendly mean of transport, the train always offers a good slice of local life, unexpected encounters, and a good opportunity to relax, read, look at the view outside: a real journey inside your journey! · We always try and choose local, family-run accommodation: small hotels, agriturismo, bed and breakfasts with local character. We want you to understand the local values and traditions by talking with the locals, asking them questions, feeling their enthusiasm and hospitality. · We suggest that you always try the local dishes, favoring locally, preferably organically grown products. Buying your lunch in a small-town grocery shop or choosing a small family run restaurant for your dinner help the local economy and help you live your holiday like a local. · We are committed to take part to initiatives that may help improve the way people travel, making cycling and walking easier and safer; for this reason, we took part to the crowdfunding project that allowed to fully signpost the official Via Francigena cycle route. · We developed a special APP that allows you to travel self-guided by following a GPS track on your smartphone or tablet. You can also navigate off-line by downloading the maps on your device. In this way you can also avoid printing your itinerary on paper, reducing your impact in terms of resource consumption and waste production. · In the trips where luggage transfer is included we always rely to local providers who are on those streets daily: in this way we avoid putting more cars on the road to carry only one or two bags per time. This minimize the impact on traffic and pollution. · We give you detailed instructions on what you should bring on your cycling or walking trip. A light, essential bag also means a minor weight, less energy spent for the transportation, less disposable items, less waste to be disposed of. · We are careful not to waste water: for this reason, we always suggest bringing a reusable water bottle instead of buying plastic bottles. We ask to the hotels not to wash towels every single day, if clients are staying more than one night and they do not require it specifically. 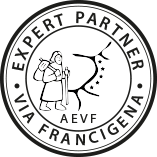 SloWays is the official partner of the European Association of Vie Francigene. We have been working on the Via Francigena for more than 10 years, contributing to the planning, mapping, security and promotion of the itinerary. Discover how. SloWays is partner of the Italian Touring Club, the most important and authoritative Italian tourism organization, which has chosen SloWays to develop the group travel programs “Camminando con il Touring”. policy no. 749/58/00104840 by Assimoco S.p.A.